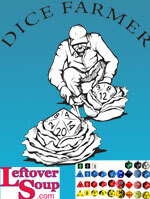 Dice Farmer is a very fast-playing game of chance for 2 or 3 players, with just enough strategy to get it fun and interesting that was developed by Tailsteak of Leftover Soup. There is a pool of 39 dice (3 each of D4, D8, D10, D12, D14, D16, D18 plus 9 each of D6 and D20 with each type of die in a different color to ease in identification) between the players. Players have a set off dice they throw every turn. Any 1s rolled are returned to the pool. Other dice that can singly or in groups total the size of a die available in the pool can add that die to the players set (ie a rolled 4 and 8 could claim a d12). Last player remaining or first with three d20s in their hand wins!